On September 26, start-ups who previously subscribed, could take part in a start-up competition at the Nordic Edge in Stavanger: The Morgenstadt Pitch. This competition brought together Europe’s leading startups focusing on urban sustainability for a live on-stage battle in front of city leadership, investors and decision makers from both the public and private sector. The winning startups received a yearlong membership of the Morgenstadt Innovation network and the opportunity to advertise their product or service on the BABLE Smart City platform. 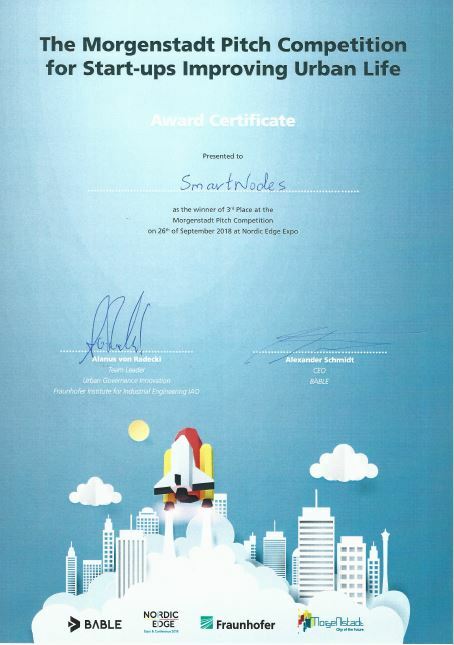 Smartnodes participated in this contest, and figured in third position. Smartnodes also held a stand at the Nordic Edge Expo start-up village, an area that brought together ambitious entrepreneurs and companies who wanted to present their products and services to the 5000+ visitors that were expected at Nordic Edge Expo 2018.